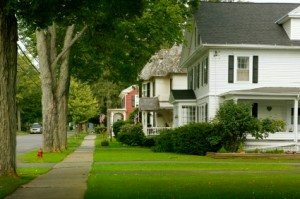 You may have noticed the signs posted in your neighbors’ yards or stickers on their front windows, displaying that their house is protected by a home alarm system. These small, unobtrusive signs do more than just advertise local home alarm systems. They act as a deterrent for potential thieves and criminals. That’s good news for your neighbors, but have you ever thought about how that may affect your own home? For just a moment, put yourself in the shoes of a criminal. You are desperate to break into a home and steal valuable items to sell at a local pawn shop or on the market. When looking for a home that looks like a safe choice, which house are you going to choose: the house without any signs of a security system, or the home with clear evidence of an advanced alarm system? It’s a no-brainer. While we should be constantly looking for ways to prevent crime and theft in our local neighborhoods and communities, we should also be proactive and assertive about defending our own home. Unlike installing a new swimming pool or building a basketball court, installing home alarm systems isn’t an expensive upgrade to your house. It’s one of the smartest investments you can make. Just don’t tell your neighbors that you’re inadvertently sending criminals their way by making your house an unfavorable choice. Maybe you should recommend that they install a security system in their home, too! For high-tech home alarm systems in Florida Keys, contact us at Nasa Security. We have over 45 years of experience in the security industry—you won’t find a better company to protect your home and business. Give us a call today!